This is my 47th monthly series. There are times when I wonder what on earth I will paint next. But that's the thing about creativity - you don’t run out. I’ll admit sometimes it flows easier than others. That’s ok, an ebb and flow is the natural way of things. Quite often there have been times when I feel the end of a month approaching and with a gasp of horror, realise that I have to come up with something else. Funnily enough, I always do. 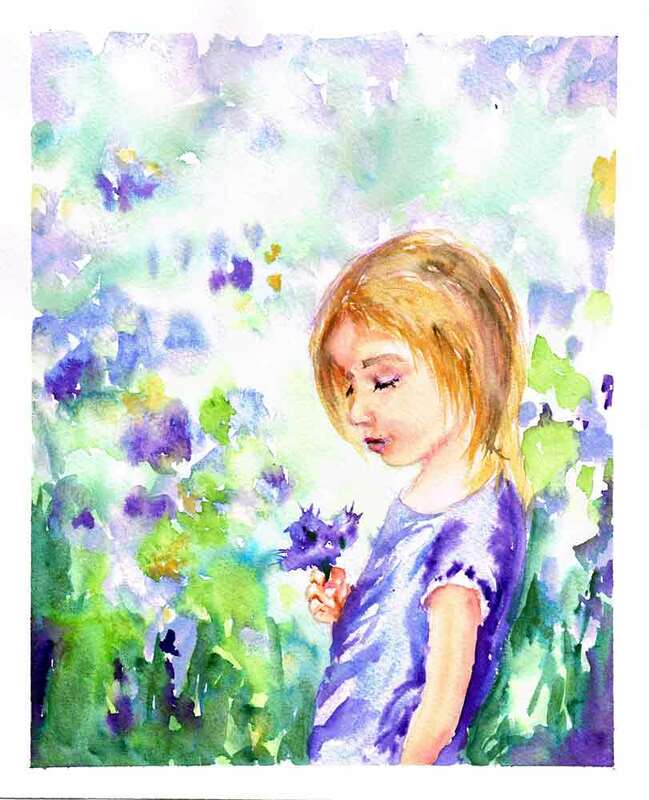 I firmly believe there is an irrepressible creative spirit in all of us that will come up with something if we have to, whether that’s a birthday gift, an appropriate response to friend or something to paint. So don’t ever let yourself believe you have run out of ideas or inspiration. Those are everywhere. You will always think of something. This month I was inspired by an art supply. One little tiny tube of paint. In the modern way, this little colour kept flashing up in all my social media feeds and inboxes almost like it was jumping up and down shouting, “Look at me, pick me!”. I hear that a lot in the art supply aisles - a place requiring enormous restraint. This particular colour is by Daniel Smith and it is called Lavender. It sits in the perfect spot between blue and purple. It is soft and gentle and calm. So now I had a lovely tube of lavender watercolour, what should I paint? Well, displaying spectacular inventiveness I decided to go for… lavender. Concerned about the lack of ingenuity I toyed with some other possibilities for this colour. But sometimes (usually) the simplest thing you can think of is the best. Also the first thing that you think of. Often we let our self doubt talk ourselves out of our first idea. Trust your instincts, I say. And this is one of the joys of having some sort of a creative practice. I can’t think of a safer place to practice things like trusting your instincts and beating self doubt. So if you are stuck for ideas of what to paint, give yourself permission to keep it uncomplicated. Artists around the world and centuries over have painted things like fruit or flowers repeatedly. It doesn't make the newer paintings any less joyful and the truth is that no subject is entirely original. It doesn't need to be. It is the artist that is original. Take those traditional subjects if you fancy them, and do them your way. By the way, I have a whole class for beginners that explains my philosophy that you can take a bit of the pressure off of yourself and paint by collaboration with paint instead of furiously trying to control it. I really enjoyed letting the paints mingle all by themselves in the backgrounds of many of these paintings to suggest the distant fields of blooms. Lavender plays so beautifully with one of my other current favourite watercolour paints… Cascade Green. 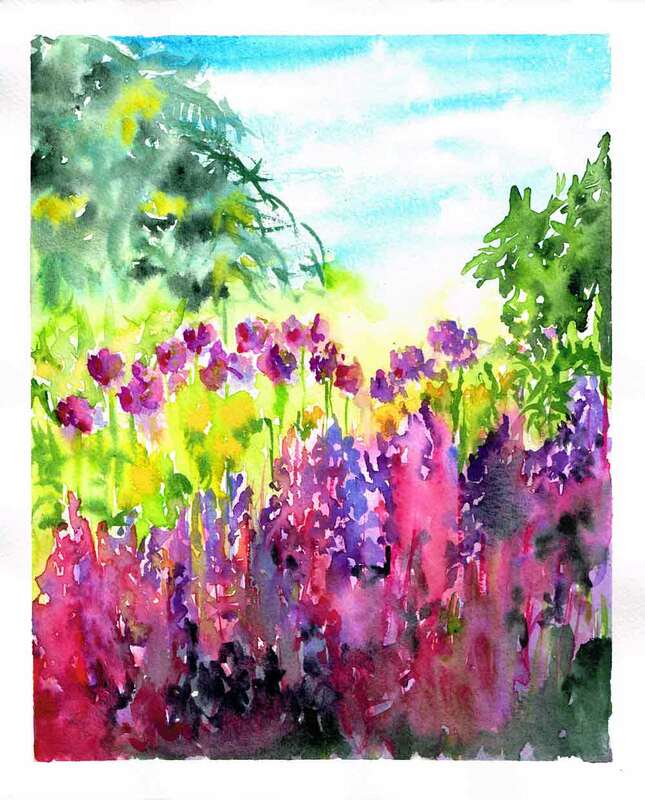 A wet page, some loose marks of lavender and cascade green and you have an abstract field of lavender without really trying. But I digress. Lavender. Now that’s inspiring. Glorious swathes of colour across sunlit fields. How delightful are those perspective lines of the farmers’ carefully planted rows? And if you just happen to catch them at sunset, then there is a chance that the sky will mirror the land’s hues of rose, gold and lavender. As is the way with ideas, one spawns another in a bountiful trail through your imagination. Lavender in a field is delightful, but how about lavender in a vase? 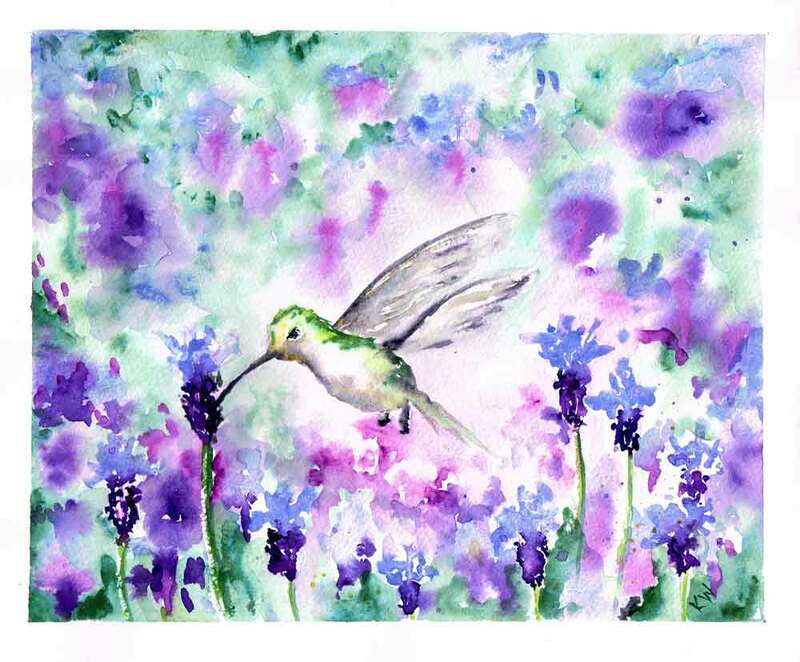 And what about lavender’s friends… a hummingbird, perhaps? 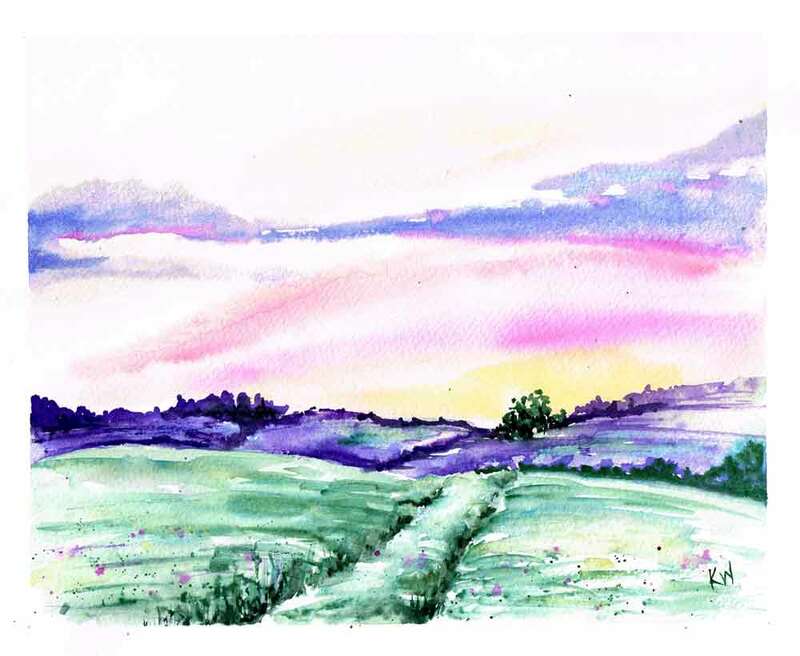 Feeling inspired to do some watercolour painting of your own? And in that case, maybe one of these would be useful?